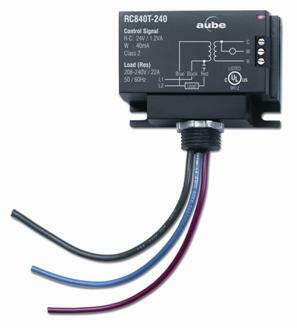 The RC840 Electric Heating Relay is designed to control a line voltage resistive load from a 24 V control signal. The RC840 operates silently and can be installed in bedrooms, living rooms, or any other occupied area without disturbing occupants. On a call for heat, the relay is immediately activated; there is no delay. This increases temperature control and comfort. Dimensions - 68 x 85 x 36 mm, 2.7 x 3.3 x 1.4 in.